I know, I know… I missed the first annual one, too… But neither of us has to miss the second annual! What is it, you ask? Well, you just go out, flip rocks and record what you see. (Of course you put the critters and the rocks back after recording.) You either make a blog post, or contact the organizers with your data (scientific or poetic, pictures or words). Really, everything you need to know is either at this website, or accessible from this website: http://www.vianegativa.us/2008/08/10/september-7-is-international-rock-flipping-day/. So plan on it. 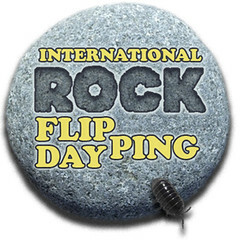 The first Sunday in September will always be International Rock Flipping Day. And you can be a part of it. Rock on! Flip out! OMG I used to be so fascinated with flipping rocks! I had forgotten all about it, and now they have a day for it!